A vote for AD is a vote cast in favour of AD’s principles. As things stand it is also a vote against both the PL and the PN. Has Mr Calleja ever considered what a vote for the PN means? 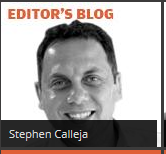 Stephen Calleja has every right to canvass the PN. I do not seek to deny him such a basic right. When exercising such a right he may consider it superfluous to inquire about the Hon. Claudio Grech’s statement that he did not recollect ever meeting George Farrugia, of oil scandal fame. Searching for reasonable explanations and possibly the underlying truth does not seem to bother Mr Calleja the journalist. He could also inquire deeper into the Capital One Investments Limited and maybe bother to ask whether as a minimum, the Hon Beppe Fenech Adami’s judgement in accepting a directorship of the Company was a grave error of judgement. Mr Calleja could examine Mario de Marco’s legal assistance to the db Group while Deputy Leader for Parliamentary Affairs of the PN Parlimentary Group. In so doing he may recollect that Dr de Marco had stated that he had sought Dr Simon Busuttil’s second opinion on whether he should take up the brief with Dr Busuttil not finding any difficulty at all. Of course, any inquisitive journalist would go one step further and seek an explanation as to what the term “conflict of interest” means. A Member of Parliament’s duty on all sides of the House essentially entails holding the government to account. This definitely includes scrutinising the executive’s actions in negotiations relative to the transfer of property in public ownership. When any Member of Parliament does not understand the above, it is serious enough. But having both the Leader of the Opposition and his Deputy without any clue on the matter, certainly says quite a lot about the ethical standards of the Opposition. If these are the ethical standards of the next government I do not think that there will be any change at the helm. It will be simply more of the same. I could go on and on. I have limited myself to the PN’s compromised leadership, as currently it is the most effective canvasser of the Labour Party. Mr Calleja has every right to ignore all this when he canvasses the PN, but then doesn’t that say a lot about his standards and values? One final point. AD held exploratory talks with the PN during which talks, the above and more were referred to. The proposals made by AD were aimed to create a functioning coalition which would not be burdened by the accumulated sins of the PN. That no progress was made is certainly not AD’s fault. Given the right conditions, AD was willing to participate in a coalition but it never accepted to be tagged as anybody’s appendage. On Friday afternoon, delegations from Alternattiva Demokratika and Partit Nazzjonalista met to discuss whether – and if so to what extent – it would be possible to forge a pre-electoral alliance between the two political parties in view of the forthcoming general election. Earlier in the day, the PN delegation had briefed the press on the approval by the PN Executive Committee on Thursday of an agreement between the PN and the Democratic Party of Marlene Farrugia. AD has always been in favour of building a pre-electoral alliance. 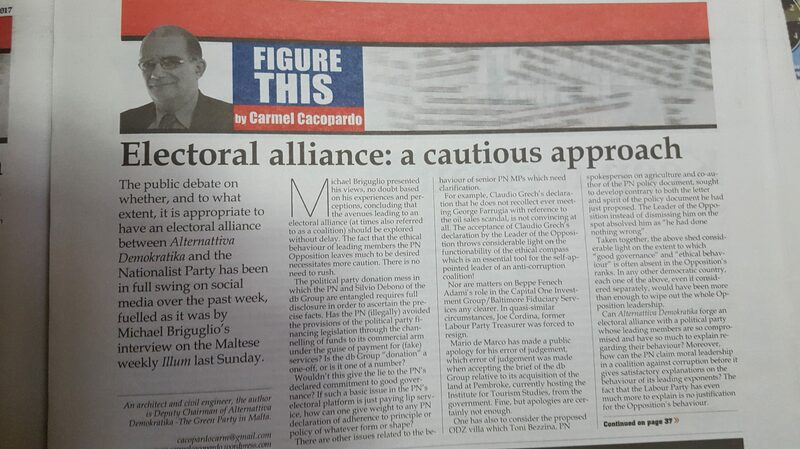 Such an alliance is necessitated by a weakness in one or more of the major political players, in this case the PN. The state of play of the electoral rules lead to the need of a pre-electoral alliance but so far, however, this is unchartered territory. 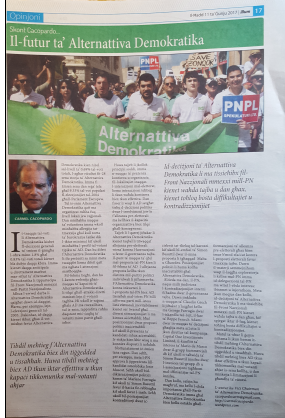 AD has criticised the PN in the past, and will continue to criticise it whenever it considers such criticism necessary. 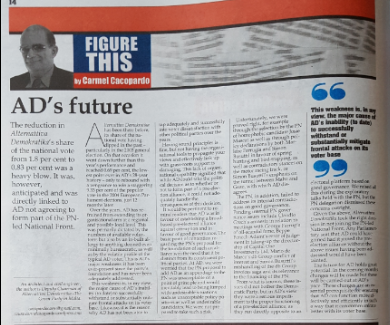 The PN has been criticised by AD for its performance in office as well as for the discrepancies between what it declares as its beliefs and how it then subsequently acts. Such criticism does not exclude the possibility of cooperating with the PN and the possibility of considering the forging of an electoral alliance, provided the right conditions are created. AD has criticised the PN for not properly handling its MPs. Claudio Grech’s declaration that he did not recollect ever meeting George Farrugia of oil corruption fame is incredulous: yet Simon Busuttil did not take him to task publicly on the matter. It was necessary, but he did not do it. 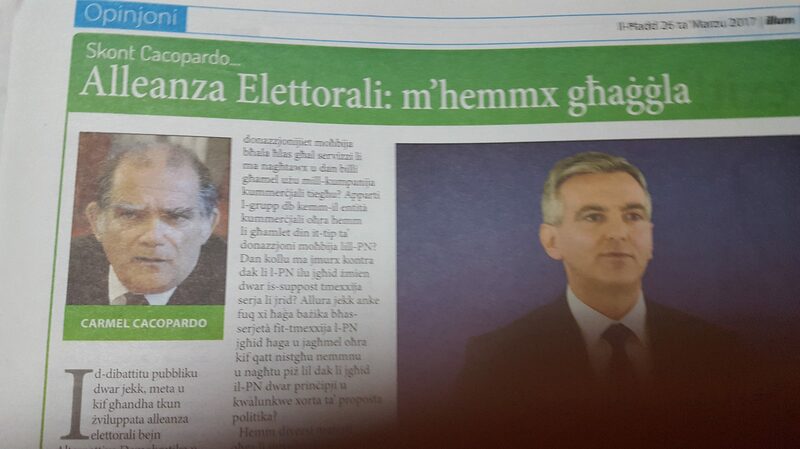 As a result, Simon Busuttil gave the clear message that he is weak when dealing with his MPs when they are evasive. This is not acceptable. Nor was Beppe Fenech Adami chastised for his error of judgement in relation to the directorship of Capital One Ltd: he should not be immune to disciplinary action. Mario Demarco’s db consultancy ended up one notch higher, with an apology – a rare event in Maltese politics. But Simon Busuttil’s role in the fake invoice debacle is still pending and he must come to terms with the facts at the earliest possible opportunity. Toni Bezzina’s ODZ experiences, whilst pontificating on the merits of environmental protection, were also swept under the carpet by Simon Busuttil. AD would have preferred to deal with a PN which does not come with this baggage, but everyone knows that this is not possible. To exacerbate matters, the Labour Party – the alternative – is much worse. The Labour Party is in absolute shambles. This fact should not lead to the erasure or absolution of the PN’s misdemeanours: they are, and will remain, on the books, acting as a constant reminder of what should be avoided. But certainly they should never be forgotten. This is part of the baggage that the PN will bring to a pre-electoral alliance. When considering the setting up of a pre-electoral alliance, one must understand that the result will be much more than the summing up of the individual parts. It should certainly denote a change in attitude and philosophy and should be accompanied by an appropriate name that reflects the new direction planned. The selection of an appropriate name for the pre-electoral alliance is of paramount importance as it is the first indicator of a willingness to change. In addition, it has to be a true reflection of the political diversity in the DNA of the proposed alliance. It is only with clear signs of the will to change that voters will consider supporting the alliance. Agreement on the general political principles that should guide the alliance is encouraging. These are primarily institutional and governance issues but also matters of basic environmental concern and governance. At Friday’s meeting AD presented the PN with a detailed and specific proposal that set the tone of the discussion. The identified stumbling block was the name of the proposed pre-electoral alliance. Unfortunately, the Democratic Party of Marlene Farrugia – most probably due to the inexperience of those advising her – did not realise the significance of the matter. She did not realise that accepting the PN as the alliance to which the Democratic Party was to be appended, was a very wrong signal. 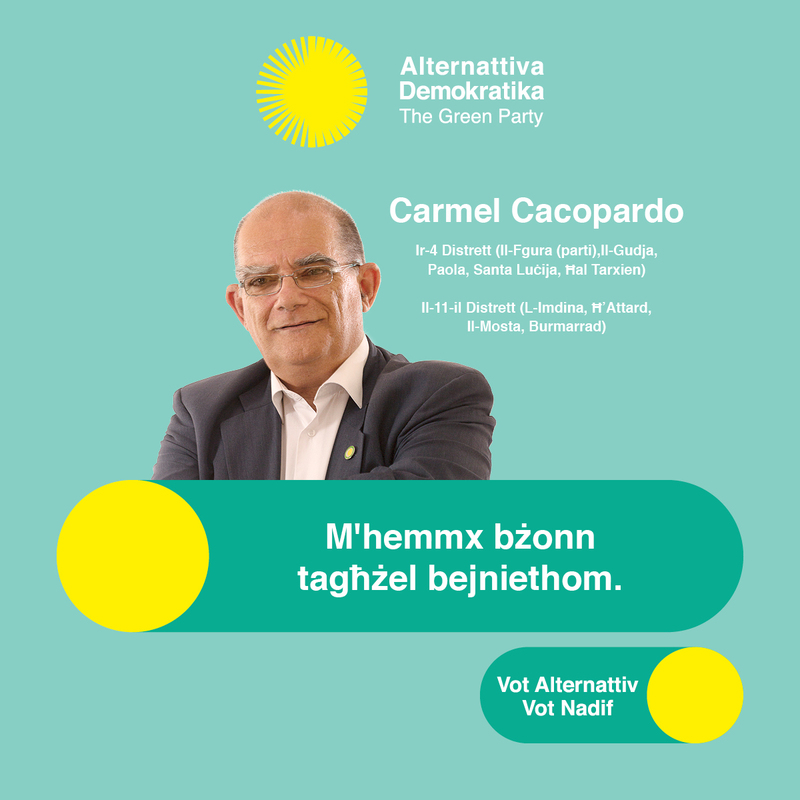 The name should reflect the nature of the alliance: an umbrella organisation of separate and independent political parties cooperating in the political project of reconstructing Malta’s shattered institutions. One thing should, however, be clear to everyone: AD will not be an appendage in the proposed alliance. AD will be an active and critical partner and not a subservient appendage.